Fall 2016 is again promising to exhibit crazy eclecticism down on the aisle, catering all the brides to the sweet fruits of rich imagination and deft hands. 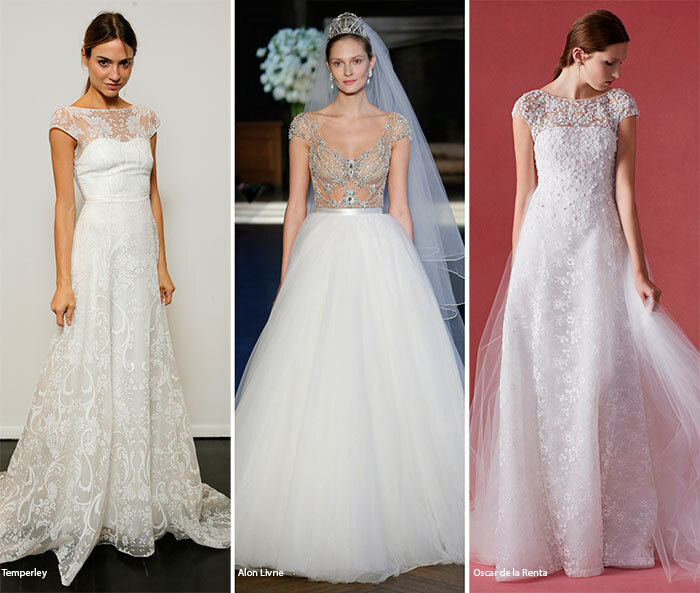 Below, we have rounded up the best fall 2016 wedding dress trends for you, each of which is ready to make you a real stunner on that memorable day. Time is again ripe to a wee bit philosophize about woman’s life that is truly experiencing a plethora of fluctuations and modulations over the time. Each woman’s life is literally split into two periods ” before the marriage and after it, parenthetically the second part coming to be more serious and intricate. There is definitely some magical energy passionately wrapping the woman’s heart and soul, some inexplicable flurry running through her whole essence when she answers “Yes, I will’ to her sweetheart’s proposal “Will you marry me?’, thereby immediately after a thought coming to her mind “What will be my white choice?’. Now in the 21st century we take it as a matter of course that a bride should be wearing all-white massive gown and veil walking down the aisle but the things were not like this before Queen Victoria. She was the first bride to wear a white gown and accordingly she was the initiator of the woman’s transmogrification into a white fairy on her wedding day. From this time onward white bridal dresses have become the main garniture of any wedding ceremony, the cherished dream of any lady and the objects of experimentations for many fashion designers throughout the world. The plunging necklines may now seem somewhat conventional and without any wow effect when it comes to cocktail dresses. Year after year the red carpet becomes the witness of a myriad of plunging necklines and the reason that they do not put us out of countenance any more mainly lies beneath the fact that our eyes have become accustomed to them and not because they are admirable no longer. But things look very different when plunging V-necklines are being passionately utilized by fashion designers on bridal dresses, making them hyper-provocative and intriguing. Brides have always been associated with modesty and restraint but nothing of the kind is happening in fall 2016. 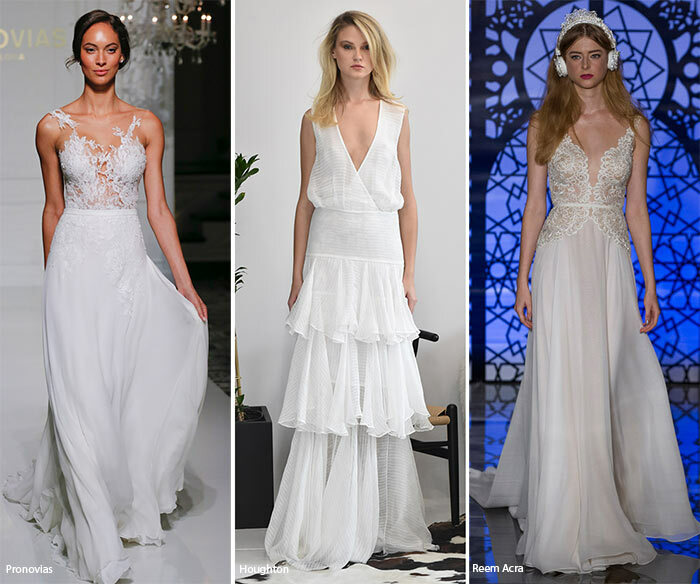 Plunging necklines with different depths and matched with variously designed sleeves and bottoms are vigorously forming one of the best fall 2016 bridal trends. Naeem Khan is matching deep plunging V-necklines with caviar beaded long-sleeved bodice and massive pleated skirt, in the end romancing the look with a flower band. Another combination of plunging necklines with long sleeves was spotted at Rivini by Rita Vinieris, where the deep neckline is not the only beguiling cleavage happening on one look; a little bit lower a sky-high side slit is blowing our minds. Hereafter plunging necklines are rocking in combination with wide and spaghetti straps or strapless solutions. Lela Rose is delivering a floral-appliqué gown, where the plunging bodice is bonded with the A-line loose-fitting skirt by a sash, while Christos is representing a ball gown with a sweetheart neckline enhanced with a tulle diaphanous overlay with our trendy plunging neckline. The trendy neckline’s another allegation with the skirt by a satin sash is seen at Anne Barge. Theia and J. Mendel are playing with spaghetti-strapped V-necklines, Theia going further with crystal embroidery at the edges and unique complementary tulle parts at both sides with the opportunity to tunnel the arms through. Temperley’s silk gown with short sleeves and shoulder cutouts looks somewhat moderate especially when contradistinguished to Reem Acra’s strapless lace dress with deep narrow plunging neckline. But it is undeniably Berta’s off-the-shoulder dresses with over deep necklines that set a new start in the process of bridal intrigues. Another big fall 2016 bridal trend is formed by sheer gowns that are at times to frustrate elderly guests of the wedding, but on no account to stop dumbfounding all and sundry. Fall 2016 is demonstrating various degrees of transparency, ranging from some tiny fragments of female body peeping out to head to toe body shadow exposition. Pronovias is again in its floral theme creating an illusion of flowerbed blossomed right on the model’s body through its unique ability to work wonders with diaphanous tulle. Reem Acra and Monique Lhuillier are also flirting with transparency on the bodice part, the latter even enhancing the effect by delivering deep round neckline solution. Isabel Armstrong’s mermaid dress with bandeau neckline and cap sleeves is demonstrating slight transparency at the chest afterwards intermitting lace bodice with a couple of sheer panels, while Amsale’s ball gown is just showing the silhouette of legs through its cutout corded lace. There is even sheer option by Elizabeth Fillmore for ladies not being able to part with their favorite trousers even on their wedding day. Vera Wang and Inbal Dror are telling a completely different story of transparency, boldly propounding the version to walk down the aisle showing not only chest, waistline and legs, but also rather intimate hips, while Alon Livne’s white suggestion with ornaments on the sheer tulle is rendering a little bit more restraint transparency at the hips. Theia having deviated from the white theme and representing blue smoke “Geisha’ embroidered sheer dress is pointing out the best option to show sensual hips simultaneously camouflaging them in a pretty professional manner. The scene when the bride enters the marriage ritual with a veiled face, then after the ceremony the groom lifting the veil as a symbol of becoming her life companion comes to be far the most commonly occurring vista both in movies and in real life, but definitely not at fall 2016 bridal runway shows. 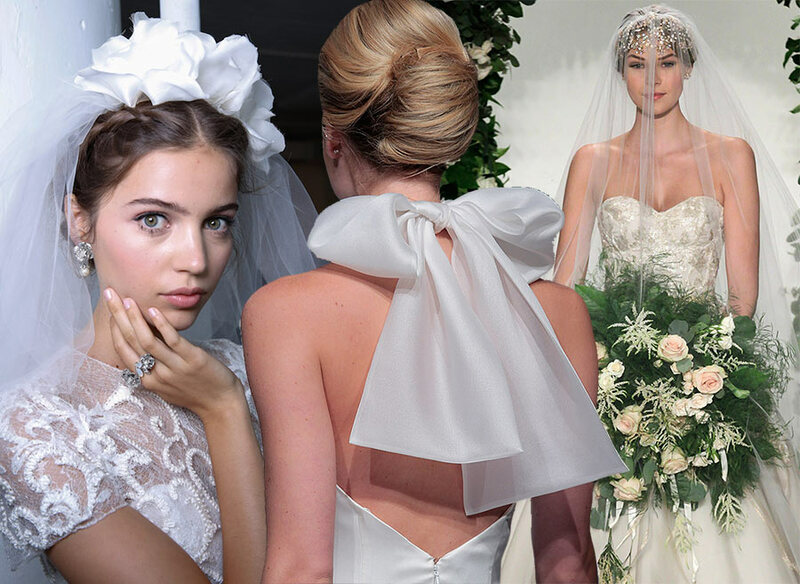 Some of the fashion designers have come up with brand new interpretation of tulle bridal veils, attaching them not on the head, but across the back or on the backside, making a real revolution in the history of bridal veils. Ines Di Santo makes a real furor on the runway show forwarding down multiple lustrous wedding dresses doubling the grandeur sense of theirs by attaching veils across the back. Some of the short dresses are experiencing a conversion into high-low dresses through veils nonchalantly hanging from behind. Claire Pettibone also plays with innovative veils whether we look at a dress with sheer chest and crystal romantic belt or one garnished with floral appliqué. We are more than fascinated with Badgley Mischka’s strapless ethereal dresses with lightweight watery veils gently cascading down from behind, on the ground creating an illusion of a small lake and the bride standing in the middle of it. 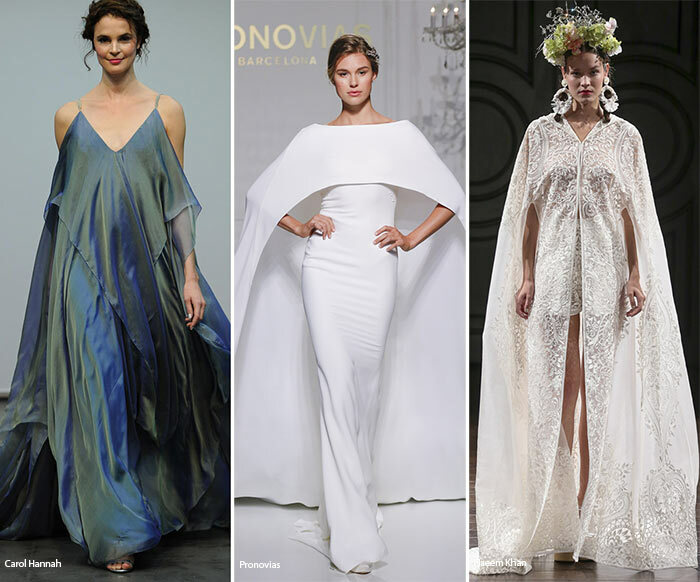 With body veils softly dipping down the brides are emanating some romantic and ethereal vibes, but with monumental capes things are quite different. Capes may well-nigh cover the whole aisle wrapping the atmosphere with some grandiose and heroic feeling, granting the bride with power and supernatural abilities and the fashion world ” with brand new magnificent trend. The steel blue satin dress with spaghetti straps and multiple layers presented by Carol Hannah is a good example of foamy cape in a frothy way stretching across the ground, at the same time planting realistic angel wings on the bride’s back, while Naeem Khan’s lightweight tulle cape with floral appliqué on it and a sporty hood is offering to wear it over bridal rompers thus fully satisfying a sporty bride’s most whimsical requirements. Pronovias is literally reigning in this crazy competition of bridal capes. A mikado silk bridal dress devoid of any embellishments but instead exposing a roomy cape mimicking a realistic noisy waterfall flamboyantly flowing down may literally kill anyone thereabout. Off-the-shoulder designs happening on a range of dresses, tops and even swimsuits have flooded the runway shows spreading the fever among bridal dresses as well. 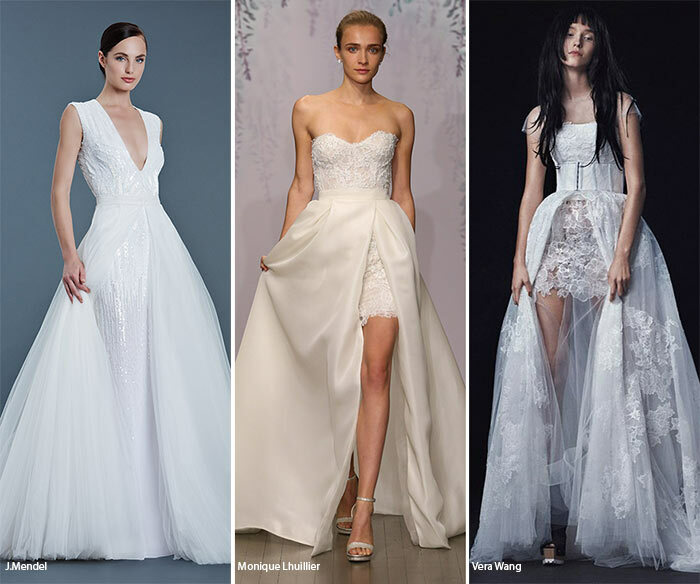 Actually, off-the-shoulder bridal gowns have always been the cream of the crop whether we throw a retrospective look at the early centuries finding out many queens, princesses and duchesses delicately baring their shoulders or follow the modern It Girls’ get-ups. Only off-the-shoulder frocks could so expertly balance between sexiness and elegance spreading some va-va-voom vibes in the air. 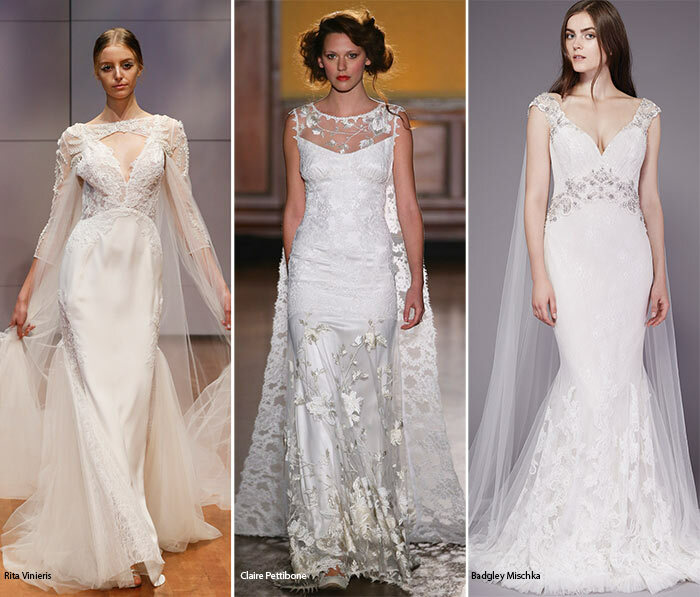 This attractive and timeless trend is again confidently invading the fall 2016 bridal collections being sure to conquer many of the aisles around. And many of our favorite fashion designers have contributed to that invasion process. We are charmed with “The Opera House’ silk Mikado Dress with off-the-shoulder design and boatneck solution presented by Lela Rose and equally are we fascinated by Marchesa’s off-the-shoulder ball gown embellished with sequined flower bunches. Off-the-shoulder design looks especially attractive and unconventional when combined with diaphanous long sleeves as per Inbal Dror. 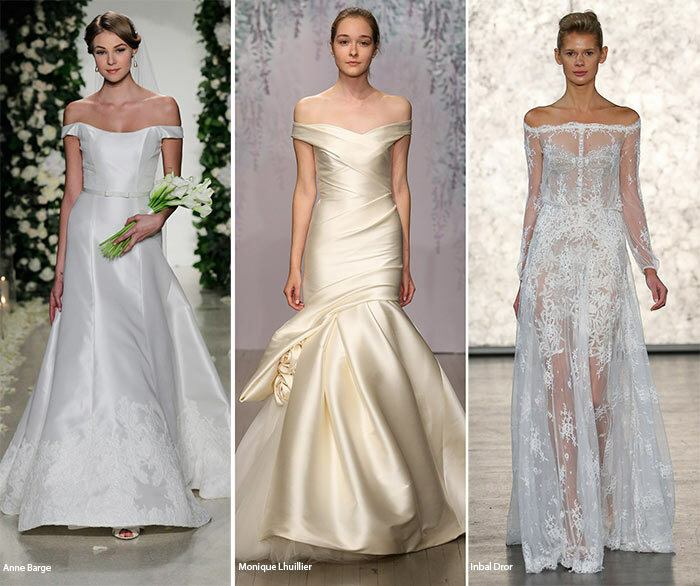 The best illustrations of elegance are those off-the-shoulder bodices with somewhat outspread V-necklines as we see with Monique Lhuillier and Maggie Sottero, while Anne Barge is representing Mikado Lace ball gown with an off-the-shoulder design, feeling like accidentally sliding off the shoulders. Off-the-shoulder design and plunging neckline in one place may become a literal showstopper wherever they appear especially when found on a bride walking down the aisle and it is Kenneth Pool providing us with that show stopping effect for the upcoming fall. In this century when all the fashion designers are endeavoring to use their creativity and skills to the fullest extent, we have already grown accustomed to seeing bridal dresses featuring short, long or three-quarter sleeves, spaghetti straps or off-the-shoulder designs, as well as strapless bodices. However, cap-sleeved bridal dresses are definitely fresh new addiction of the designers borrowed from an office girl’s wardrobe packed with classic shirts. And we must admit that the adoption was really effective and successful bringing forth one of the best fall 2016 wedding dress trends. They look equally charming and romantic whether coming enhanced with beaded embroidery, at times with tiny necklace-style embellishments swinging down as can be seen at the Alon Livne White fall 2016 runway show or appearing to be garnished with multiple pearls, a technique applied by Oscar de la Renta. But it is the British fashion house Temperley that has largely focused on cap sleeves while designing their fall 2016 bridal lineup, at times raising our doubts about Alice Temperley’s great addiction to sporty caps this year. We can see cap sleeves both on minimalistic bridal dresses devoid of any decorations and on more extravagant ones encrusted with beads and sequins up to being found on a bridal pantsuit with satin wide-leg bottom and lace top. 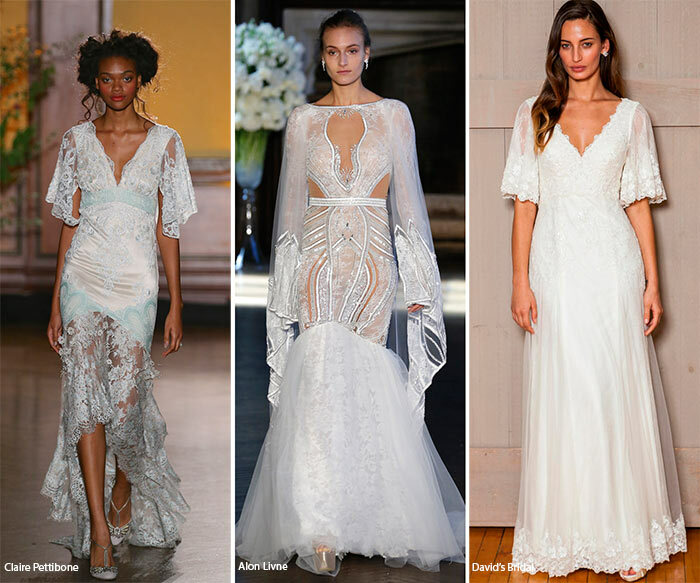 Retro-style fluttery sleeves relentlessly flirting to and fro are outlining the next big bridal trend for fall 2016 ideally complementing the bride’s joie de vivre mood and the wedding’s celestial atmosphere. Tulle, lace, gossamer and a range of other lightweight fabrics are the main guarantees of the fluttery behavior of the sleeves. Claire Pettibone ivory lace dresses with asymmetrical hems that are providing crazy motions are making very harmonious assembly with fluttery sleeves, while minimalistic snow white dresses by Sarah Seven and Matthew Christopher will be just fallacious to call anything like common or simple so much delicacy are the fluttery sleeves sending out. 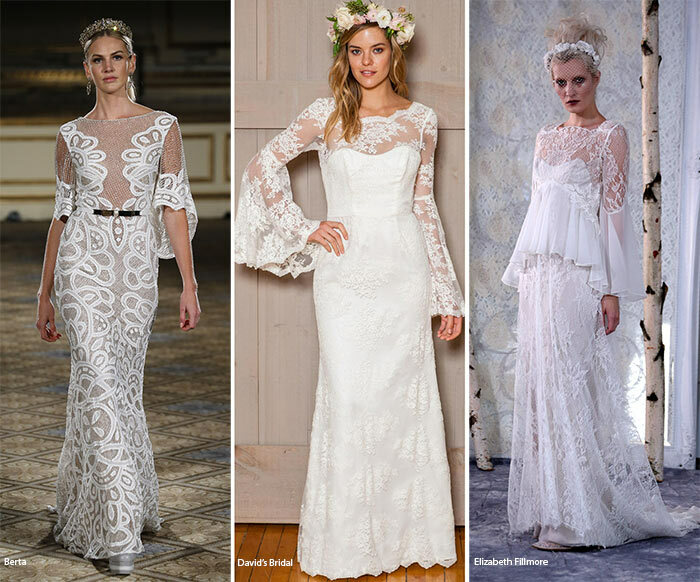 The bell sleeves so trendy in the early 2000s are making a comeback finding their expression on bridal dresses as well. This romantic and celestial detail reminiscent of the early times is happening in many fall 2016 bridal collections with different lengths and designs. Berta is featuring a faintly sparkling organza bridal dress with floral appliqué and the wide bell sleeves creating wavy hemlines, but wideness reaches its pinnacle with Inbal Dror stunning dress on which bell sleeves are at any moment to take the bride up to the sky. Lee Grebenau has designed 3D-floral-appliqué bell sleeves not as a part of bridal dress but as a unique accessory replacing gloves. The Melissa Sweet bridal dress is a vivid fragrant flower; bell sleeves matched with a belt of iridescent flowers have been printed in our memory forever. In all likelihood sweet and warbling birds were the frequenters at the windows of many luxurious ateliers when fall 2016 bridal collections were being designed passionately. 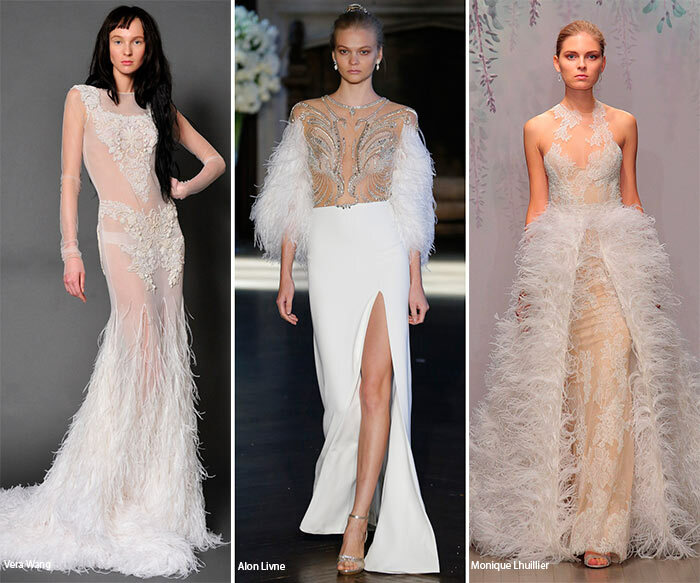 Whatever was their inspiration or intentions, fragile feathers look super-effective on bridal dresses and are proving to be one of the best fall 2016 bridal trends. The designers have played with sultry feathers finding different locations for them. The Monique Lhuillier silk white and Chantilly lace bridal dress could have blown minds with its floral illusion neckline, but it is softly pushed back when the feather over skirt is coming into view. Naeem Khan has included a couple of mini bridal dresses, one of them appearing with a feather skirt. A Vera Wang luxurious dress featuring an effective sheer-feather mixture is perfect for heading to a wedding or a mediaeval theatre. Looking to Alon Livne we notice some feather parts attached either on one shoulder coming to caress the bride’s one cheek throughout the whole wedding ceremony, or on both sleeves, undoubtedly resembling birdie wings. Flirtatious fringes are definitely one of the best trends for fall 2015 embellishing a range of saddlebags, boots, vests and jackets in a pretty cowboy style and will also rock spring 2016, confidently continuing their pace through fall 2016 bridal collections, wrapping them with a bohemian free-spirit twist. At times fringes are accessorizing the hemlines of the skirts or are cascading down as if long straight hair as can be seen at Houghton. Theia fringes are swinging down the back of the satin slip dress, while Naeem Khan has focused on African tribal style showcasing tiered fringes on a mini dress. The Francesca Miranda clingy lace dress is complemented with densely arranged fringes intricately flooding down. Lightweight tulle and organza fabrics appearing in their genuine way without any embroidery or embellishment are to bring an airy twist to the whole essence of the bride. 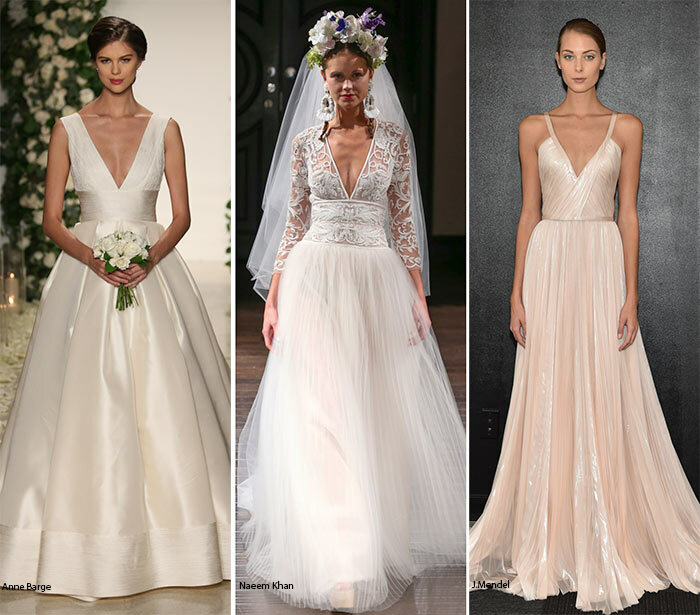 That very breezy and somewhat soul-soothing feeling might have served as the main reason for many fashion designers to include airy dresses in their collections thus making them one of the best bridal trends of fall 2016. Some fit and flaring bridal dresses are bringing an airy atmosphere only at the bottom part of the skirt as it can be seen at Hayley Page or Kelly Faetanini, whereas Houghton is mainly focused on airy sprezzatura, at times even bringing forth so many drapes and layers on one single wedding dress that you are transported up to the air among the clouds. Wedding dresses with detachable skirts are the best example of multifunctionality and additionally one of the main fall 2016 wedding dress trends. We always appreciate those reversible coats or those bags that come to be clutches and shoulder bags at the same time, and equally do we appreciate bridal dresses that are effectively bringing into action the 2 in 1 concept. 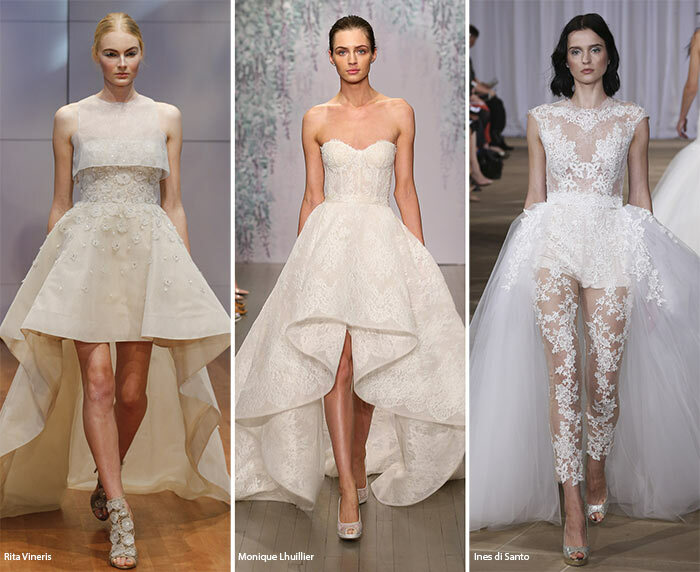 Given that magic-fancier ladies just adore such magical transformations many of our favorite fashion designers have come up with this wonderful solution, among them being Monique Lhuillier, Amsale and Jim Hjelm and if we see Amsale playing with an elongated detachable skirt over the same-length clingy skirt, Monique Lhuillier and Jim Hjelm are intentionally perplexing the brides with long-short combinations. Sky-high slits are nowadays reigning not only among the bridal dresses but also among many cocktail dresses and everyday pieces. The new century is just screaming to fully open sensual legs and that scream definitely does not stop even down the aisle. Whether it is cut on one side or in the center, the effect is equally mind-boggling and psychedelic. Ines di Santo and Monique Lhuillier are proponents of one side slits that may even stay closed when the bride is standing but then making a real splash in case of even the slightest motion. Reem Acra is also giving preference to side slits but simultaneously designing the bottom of the skirt with multiple airy ruffles thus marrying intrigues with flirts. Undeniably centered sky-high slits are doing wonders with super-intimate cleavage and the effect is doubly magnified when the bodice of the dress comes to be without any straps. Inbal Dror is on. There was a time when symmetry and beauty were synonyms, whether it was about a woman’s face, a construction or a clothing piece. Nowadays we appreciate extravagance and eccentricity rather than pure natural beauty. We admire seeing a woman with colorful eyes or a construction, the right part of which is abruptly different from the left part. So in this ubiquitous imbalance it is quite predictable to see the fashion world jam-packed with asymmetrical hemlines. Asymmetry has also touched the fall 2016 bridal dresses stimulating many fashion designers to launch high-low bridal gowns. We are more than fascinated with chic and gorgeous ball gowns by Monique Lhuillier and Anne Barge that start from short then gradually becoming floor-sweeping at the tail, whereas Vera Wang stays true to her signature eccentric style treating the idiosyncratic brides to ruffled high-low bridal dresses styled with a romantic black bow at the waist. Floral theme is going strong for already several seasons and the impact of wonderful nature on all the designers is more than evident. The blooming nature has found its expression on a myriad of pieces in the form of floral prints and motifs but also in the form of 3D appliqués that have all the chances to convert any piece of clothing into a realistic floral meadow. 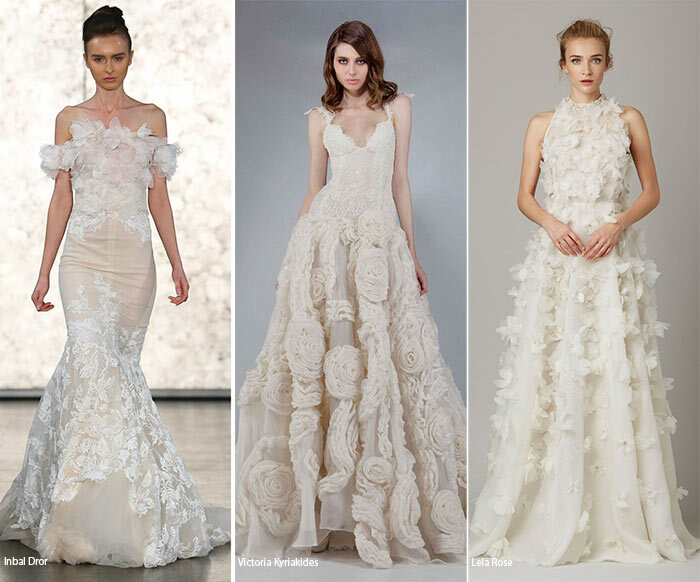 Fall 2016 bridal collections have just fallen into floral appliqués starting from tiny petals to massive and oversize flowers. The dainty and fragrant flowers scattered on the bride’s body on that important and turning day of her life are definitely cushioning her excited heart and our favorite designers know for sure how positively they may affect the bride. Lela Rose and Inbal Dror organza wedding dresses are exposing intricate petal embroidery, while the gazar dress by Angel Sanchez is embellished with tiny hand-cut flowers at the neckline and all over the skirt. Given that Victoria Kyriakides and Monique Lhuilllier have largely gone for ball gowns for the upcoming fall season, accordingly the floral appliqués offered by the fashion brands are fluffy and roomy. Oversize roses are covering the whole surface of a Victoria Kyriakides wedding dress, whereas Monique Lhuillier is hiding some rosette details under the peplum. An Ines Di Santo asymmetrical mermaid dress is again featuring floral appliqué at bust and hemlines but a little bit deviating from the all-white theme appearing in powdery pink shade. In the Western culture the bridal color is usually white but definitely not in the Eastern culture. Some Eastern women give their preference to the red color when walking down the aisle to get married, as the red is considered to be the traditional color of luck and auspiciousness. Boundaries between the West and the East have already blurred and now red dresses may be seen on Western brides as well, but almost always evoking some frustration among the guests and indisputability of the bride’s extravagant and audacious nature. 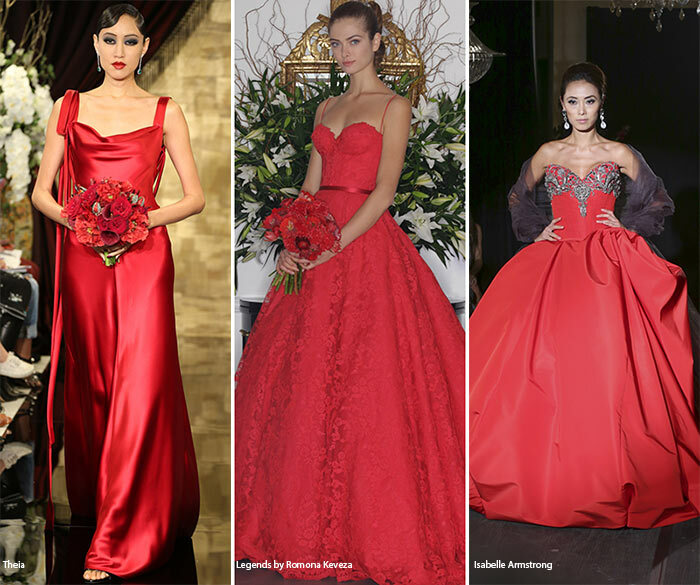 Some of the fall 2016 bridal collections have reflected on passionate red dresses offering a couple of red options next to white ones thereby creating a pretty effective contrast on the runway. The Theia fall 2016 bridal lineup is bringing about red dresses with abruptly different designs. It is quite difficult to choose between a poppy red hybrid rose embroidered tulle and a poppy red satin slip dress and it is also difficult not to discern that red silk organza ball gown that may undeniably make its way onto the red carpet one day. 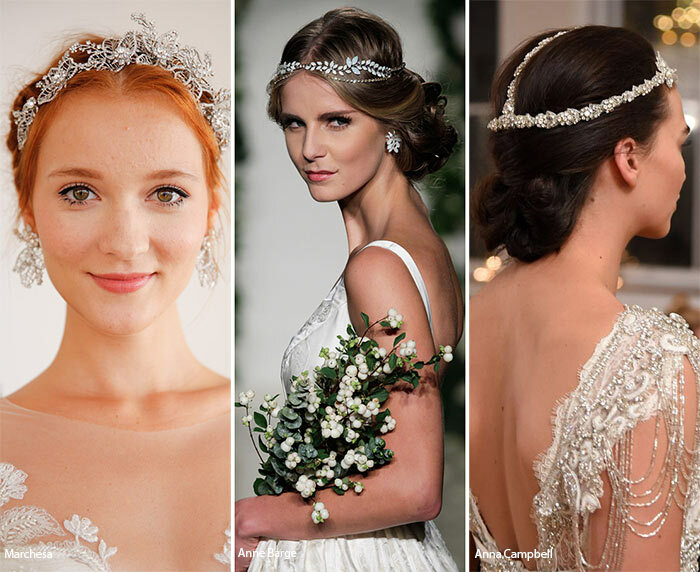 Another big fall 2016 bridal trend comes to be hair jewelry that is sometimes so gently and charmingly decorating the bride’s hair that, as a matter of fact, no veil is needed. These adorable details are usually designed in botanical motifs as we see at Marchesa and Anne Barge. Hayley Paige hair jewelry is conveying some Arabian vibes, covering the whole head then cascading down the face, while Berta is playing rather conventionally presenting tiny crowns as hair decorators. Minimalistic bouquets with a single type of flower that should be tossed later in the middle of the wedding ceremony are all the rage now, extruding those multicolored, at times even heavy ones and putting emphasis on the bride’s feeling of comfort and levity. That concept goes even further when we see one single flower in the bride’s hands.